With the SXSW detours/spring training period out of the way, concert season is in full swing as festival lineups are announced, tours extended, and bands start descending on bigger cities in support of new records. Brooklyn’s TV on the Radio are in the midst of a big tour promoting their latest, Seeds, and hit the Fox Theater in Oakland on March 31st. If the show wasn’t listed as a sellout, it was damn close, as the spacious theater was packed to the back by the time TVOTR took the stage. First, openers Nostalghia started things off with a surprisingly powerful set. I say surprising, because to look at the band, the three-piece couldn’t have fit the definition of “sparse” any better: lead singer Ciscandra Nostalghia, who might make Olive Oyl feel chubby, sported knee socks without shoes, long brown hair down to her asstalghia, and a bikini top and short skirt with prints of the Virgin Mary. She was flanked by drummer/sound arranger Roy Gnan, and Adele Stein playing a skinny electric cello. At first glance, they looked out of place on the huge stage of the Fox, but once they got going they had no trouble at all filling the cavernous space, largely due to the heavy low-end of the cello and Nostalghia’s surprisingly heady vocals. 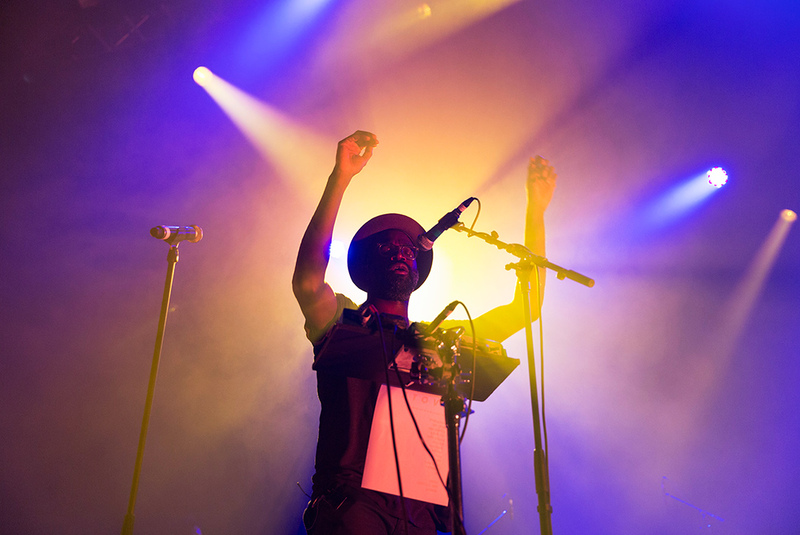 TV on the Radio took a little longer getting on stage than many in the front row would have like – how quickly they turned on the roadie who had to misfortune to keep coming on stage– but once TVOTR came out there were no complaints. The slow buildup of opener “Young Liars” got the crowd into a fever pitch, and it never really let up, especially when they exploded into Seeds‘ most explosive track, “Lazerray” next. The 16-song setlist was a good mix of old and new, with the classics/crowd pleasers one would hope for like “Wolf Like Me,” and show closer “Starting At the Sun,” mixed in with a healthy dose of Seeds tracks. Singer Tunde Adebimpe is in large part the signature sound of TVOTR, but guitarist Kyp Malone’s tracks are a great change of pace on the records, and that was the case here as well, with his tunes “Red Dress” and particularly “Could You” providing a more straight-up rock counterpunch to the rest of the set.